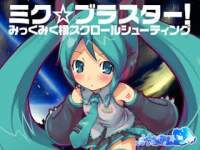 Mikuman X (known as Mickman X, but due to the original spelling of her name and Mick capable of being pronounced as Miku in Japan, it's a bit of a language joke of sorts) is a short and action-packed Mega Man X clone made with the "Game Maker" program and stars Hatsune Miku, the very popular vocaloid. It's noted for its high difficulty level. In this game, Miku can shoot basic projectiles like Mega Man (she can't charge her shots, but jumping and shooting oddly acts like a charged shot without the charge) and swing a leek like Zero's sword. She is granted very slight invincibility from most attacks with most of her attacks. The reason is because even slight errors can result in a most punishing defeat. Her job is to start outside of an enemy fortress and work her way into the boss' chamber to fight Mega Man 2's "Air Man".